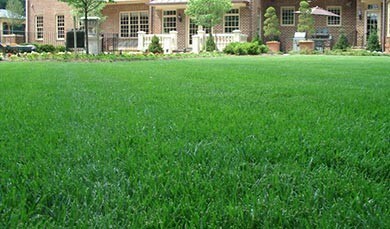 Looking to rejuvenate your lawn and keep it healthy year-round? Aeration and overseeding is a core part of any lawn care service, critical to the sustained growth of the grasses that bring your property to life. Not only does lawn aeration provide much-needed nutrients, but it protects the grass from harmful weeds, insects, and even disease. And combined with overseeding, you’ll notice an improvement in turf density as well. Let the experts at O’Grady’s Landscape restore health and beauty to your yard with our Northern Virginia aeration and overseeding service—call us at 703-533-5001 to schedule your consultation today! For best results, we recommend you have lawn aeration completed in late summer or early fall—by October at the latest. And be sure to schedule early for maximum scheduling flexibility, keeping in mind that you’ll only need this service once per year! Once aeration is complete, your lawn is in optimal condition to begin seeding. Again, this is a process to be done in the fall when days are warm and nights are cool. Why? Because fall lawn seeding allows the roots to strengthen over the winter months so the seedlings will blossom when spring comes. Lawn seeding is done with the primary purpose of protecting your grasses through the cold, winter months to promote thick, weed-free, and healthy growth—and at O’Grady’s Landscape, you can be confident that we use only the highest quality seeds to get the job done right. If you’re ready to schedule aeration and overseeding in Northern Virginia, you’ve come to the right place. O’Grady’s Landscape has extensive experience serving homeowners in Great Falls, North Arlington, the City of Falls Church, McLean, and Vienna and can help you with all your lawn maintenance needs so you can extend the life of your grasses and leave a lasting impression on all your guests. Let your lawn breathe again with lawn aeration and seeding services by O’Grady’s Landscape—call us at 703-533-5001 to schedule a consultation today!